Ok, I am perhaps confused about what’s really going on–as there have been a lot of announcements about CalHSR here recently–but either I’m crazy, or this announcement from the Feds is a waaaaay bigger deal for California than anybody has noticed so far. Here’s the story from Bakersfield.com: Feds Insist that the first leg of bullet train reach to Bakersfield. The additional $816 million is contingent on a commitment to get the train there. 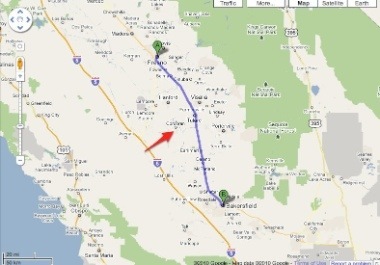 So….my understanding of what the CalHSR promised to with the first leg was that it go from Fresno (population 505,000–HSR to Des Moines!) to Corcoran (population 25,600–no comment). Corcoran is located with the red arrow on the little Google map I’ve pasted together. 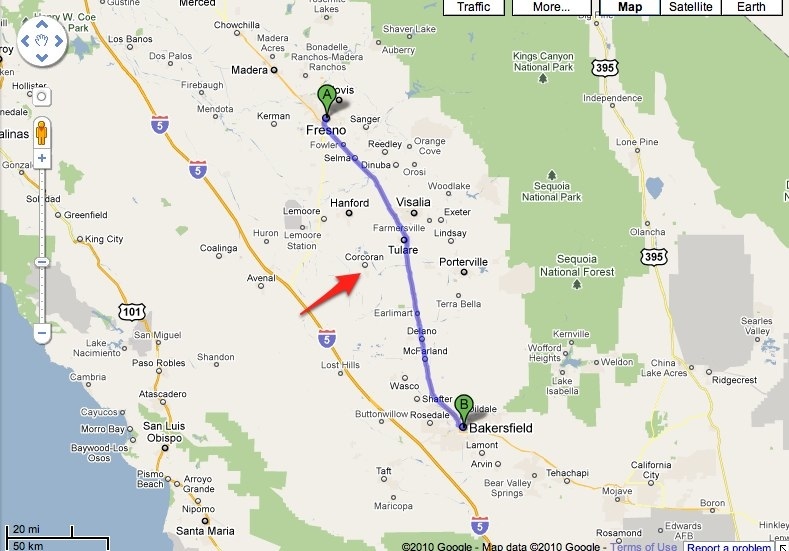 Now, Corcoran is about 50 or so miles away from Fresno. Bakersfield is about 100 miles. Does that strike anybody as being…well, at lot farther? Why isn’t anybody besides me….concerned about the Feds holding out? I kind of think this move puts California on the hook for a lot more money. Or a really pared down project. Or…?